A new virus has been found in wasps, and it has the potential to spread to honeybees, who, as many are aware, are one of the world’s key crop pollinators. The virus, which has been named Moku, was found in the western yellow jacket, a particular wasp species considered to be a pest in the state of Hawaii. This wasp feeds on a diverse number of arthropods including honeybees. Because of this, researchers from multiple institutions believe the virus could provide a new threat to honeybees who are already facing threats like colony collapse disorder (CCD) and varroa mites. CCD, to be thorough, is the mysterious disappearance of worker bees from a hive’s colony with only the queen, her eggs, and immature bees remaining. Varroa mites, on the other hand, are tiny mites that can render a bee’s wings useless and cause them to develop deformed wing virus (DWV), which is known to infect hives worldwide. The mites feed on the blood of honeybee larvae, which can affect and pass on the virus to those growing bees, thus allowing the virus to work its way up to adult bees. Researchers believe the effects of varroa mites are getting worse with the increased movement of bee colonies over large geographic scales for large scale pollination operations. Dr. Bayer Wilfert, a geneticist who specializes in host-parasite interactions, explained the change humans may have facilitated through the relocation of swarms, which are halves of other hives that have grown too large, forcing the swarm to branch off with a new queen. “Moving animals and plants around, especially to areas where they are not native, can facilitate the spread of diseases.” Humans tend to move hives at long distances, causing varroa mites to be carried further than the normal flight range of bees. Like the DMV virus, Moku can paralyze a bee’s front legs, damage its wings, and reduce its lifespan, and both viruses have been detected from the same location. Most infected honeybees are removed from the hive, but during cooler seasons, the number of bees infected can quickly increase. A sudden decline within the colony can cause the loss of an entire hive over winter. Fortunately, the virus isn’t harmful to humans, but it does put other pollinators at risk and, in the long run, affects key crops and our agricultural systems. 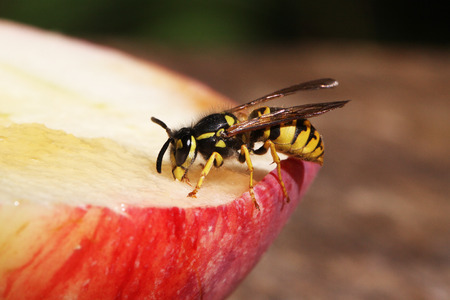 Scientists are still researching how the virus may spread from wasps to honeybees. The only suggestion is through flower nectar, a shared resource between both wasps and honeybees.